My first trip was to central NSW to scout out some orchids for my supervisor, Rod Peakall, and also to check on some bearded greenhoods and snail orchids that I could possibly work on. I did a big loop from Canberra up past Abercrombie and Cowra, through the wonderful Callitris woodland in Conimbla National Park before camping the night at the Weddin Mountains. My goodness, the bush was dry! Nothing inspiring on the orchid front. Ironically, I copped some heavy rain that night at the Weddin Mountains, but it was much too late to make the orchids flower. The next day I drove out to a couple of sites near Weethalle and Rankin Springs, and then down to Cocoparra National Park near Griffith. Here the dry was worse. There was no green grass at Cocoparra, let alone orchids. Two years ago for my Honours I visited the site near Rankin Springs at the same time of year and saw hundreds of spider orchids. This year I saw none. Zero. Its amazing how suddenly the orchids can shift from carpets of flowers one year, to nothing the next. The orchids haven't died, of course, they are just sitting below the surface, saving their energy for the next, perhaps better, season. I had a lovely, relaxing, enjoyable time, though. One thing I discovered was that because no orchids were flowering, I was just driving to beautiful locations with nothing to do except wander around the bush in search of flowers. The joys of fieldwork. Sure, nothing was working out, but I was having a wonderful time. Another thing I discovered was that I keep on forgetting to take proper photos of what I'm doing, where I go, the places I camp... 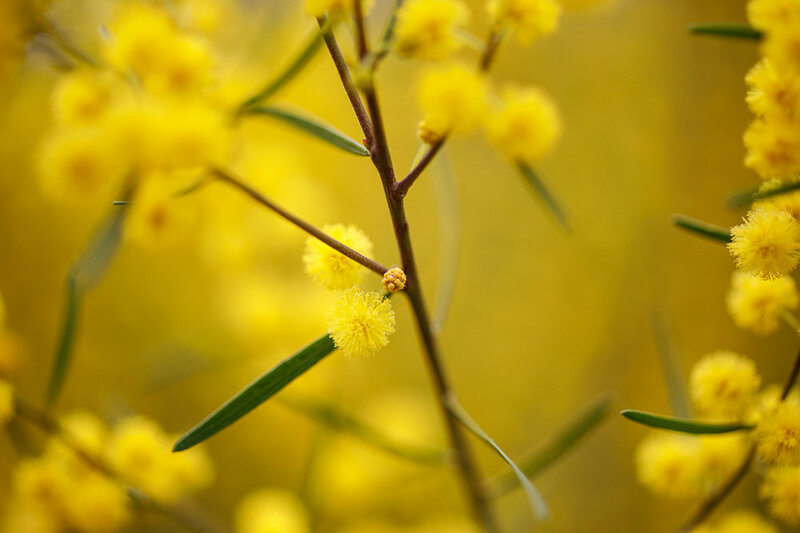 So the photos for this blog post come from a patch of bush near Ardlethan in central NSW, where I was wandering around looking for non-existent orchids, surrounded by almost solid yellow from the flowering Acacia bushes. The smell from all of the bushes was almost overwhelming. Eventually I had to stop and admire the cheerful yellow flowers, they are actually very photogenic little furry clusters. Getting back to Canberra, there was suddenly much less reason for me to be based in the south-east NSW region. It was too dry. The rainfall anomaly graphs on the Bureau of Meteorology showed parts of Victoria had received average rainfall. Plus, Mum and Dad who lived in Melbourne had been complaining about the rain, which sounded good to me! So I made the decision to cut my field season around Canberra and instead move to Melbourne for a month. My fieldwork there took me to more cool places, and was moderately successful...but I've ranted enough already for one blog post. The bush in central NSW looking dry, but yellow.